When Rhonda Grassi and Nancy Welch moved into their Erie home 12 years ago, they could see 13 houses from their front and back yards. That’s life in a subdivision. But the couple had full reign over the landscaping of the new home, and Welch, a Realtor and interior designer, has experience with landscape design. So they set out to bring privacy and intimacy into their large lot in Arapahoe Ridge by using layers of trees, foliage, bushes and flowers. 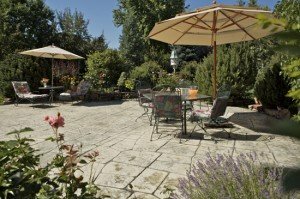 Today, the backyard has a border of mature trees along the fencing, and their large, curved patio is bordered with flowers, ferns and shrubs. The landscaping creates an intimate spot for dinners, parties and lounging within the big backyard. They love fresh-cut flowers, drying flowers and trading bouquets with neighbors, so the backyard has a big patch of baby’s breath as well as zinnias, petunias, tulips, purple morning glories, a stargazer lily and peonies. The focus is very much on color. And while the whole thing started with a plan, it’s also become a lot about spontaneity, adding and moving things around. Welch also swaps plants with neighbors.